Mobile tickets are the safest, most convenient and flexible way to receive and manage your tickets while increasing protection against fraud. You may quickly and easily enter the venue using your smartphone while reducing the risk of forgotten, lost, stolen or counterfeit tickets. In addition, you can manage, transfer and/or sell your event tickets at any time. Managing tickets through the respective mobile platforms is free. There are no costs to view, transfer or donate your event tickets. Yes. 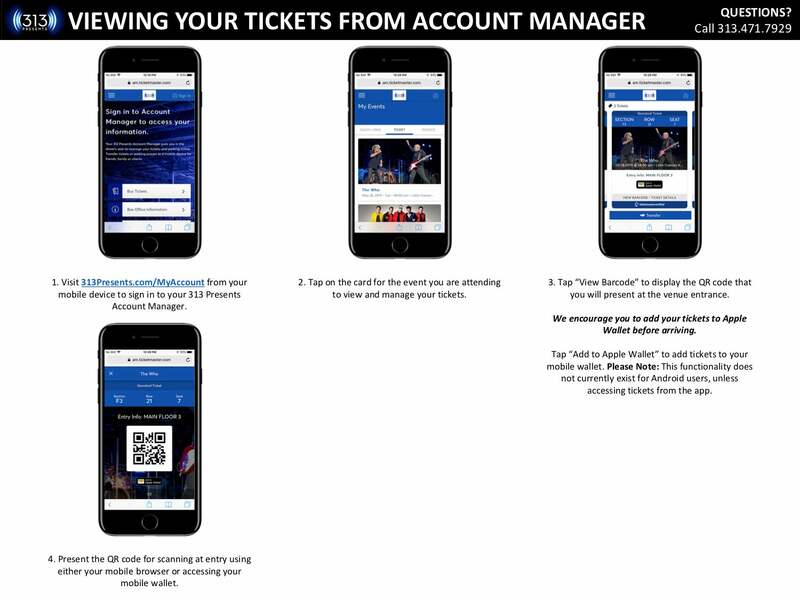 You can always access your tickets in your 313 Presents Account Manager via your smartphone's Internet browser at any time. Can I access my tickets for DTE Energy Music Theatre, Meadow Brook Amphitheatre and Michigan Lottery Amphitheatre at Freedom Hill through The District Detroit App? Yes. We highly encourage guests to download and utilize The District Detroit App to manage their 313 Presents event tickets. No. The "print-at-home" functionality in Ticketmaster.com and 313 Presents Account Manager is no longer available for any events at 313 Presents venues. If I don’t have access to a smartphone, how do I access my tickets? If you don't have access to a smartphone, please call the Little Caesars Arena XFINITY Box Office at 313-471-7929 in advance or visit the appropriate venue box office the day of the event to get your tickets. Tickets viewed on a smartphone will have a square QR code along with the regular ticket information – event date and time, PORTAL (for Little Caesars Arena events), section, row and seat. Additional information is also on the “back” of a mobile ticket by clicking the small info icon on bottom right of the screen. If I am a Royal, Prime or Group ticket holder, how will I receive my mobile tickets? Access to mobile tickets is via Ticketmaster Account Manager login at 313Presents.com/MyAccount from a smartphone. You can also access via The District Detroit App. *Those receiving a ticket transfer must either have an existing account or create a new account when they accept the tickets. Yes. Once you select the event you're attending, you can view all your tickets by swiping left or right. We recommend transferring your tickets in advance to your friends and family, so each person can scan their ticket upon entry. Can I use a screenshot of my tickets to enter the venue? Can I manage my tickets on event day? Yes. You may view barcodes on your mobile device or transfer tickets online up to the start of an event. We recommend viewing and saving your tickets to your phone's digital wallet in advance, in the case of unexpected WiFi or signal interruptions. What if my phone breaks, dies or gets lost or stolen prior to entering the venue? Please visit the appropriate venue box office to have your tickets printed. You will need to present a valid photo ID that matches the name on your account. On the login screen, click "Forgot Password?" then enter the email address on your account. Once you submit, check your email for a link to reset your password. If you purchased tickets for a relative, friend or client, simply transfer your tickets to them. Click the "Send" button within the order and enter the recipient's information. After the transfer is sent, the recipient will receive an email notification to accept their tickets. Once accepted, the tickets will appear in the recipient's 313 Presents account. The recipient must have a 313 Presents account to accept a ticket transfer. If they do not have an account, they can easily create one when they accept the tickets. Please Note: Once the ticket transfer has been accepted, the tickets in your account are no longer valid and you cannot get into the event with those tickets. Can I enter the venue with multiple tickets for more than one person using one smartphone? If all members of your party are present at the time of entrance, you may enter the venue with one smartphone. The ticket holder can access multiple tickets on their phone and swipe to scan each ticket. We recommend that you transfer tickets to your friends and family prior to the event for easy access into the venue. You may only cancel the ticket transfer if the tickets have not been accepted by the recipient. If they have been accepted, you cannot to cancel, and the recipient must transfer the tickets back to you. Once canceled, you may re-send the tickets to the correct email. What if I lose connectivity/can’t connect to my account at the venue? While complimentary wireless access is available at Little Caesars Arena and in The District Detroit, we encourage you to download the tickets to your digital wallet before heading to the event. Because we do not have complementary wireless access at the Fox Theatre, DTE Energy Music Theatre, Meadow Brook Amphitheatre and Michigan Lottery Amphitheatre at Freedom Hill, we do encourage you to download the tickets to your digital wallet (Apple Wallet, Google Pay, etc.) before heading to the event as cellular service may not be reliable. Tickets may be transferred up to and throughout the event you are attending. Once the ticket is scanned at the gate, however, it will no longer be available for entry into the venue. 313 Presents and the venue managing partner, Olympia Entertainment, use the highest security measures available to ensure your personal information is protected. The information provided is utilized for event purposes only and is not sold to any third-party entities. If you have any questions, please directly contact a box office representative at [email protected]. We're happy to help. How do I learn about mobile ticketing for the Detroit Red Wings and Detroit Pistons games?